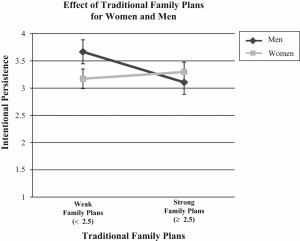 Family plans: women’s desires to care for their family lead them to choose more flexible careers. Self-assessment: women’s perceived deficiency in core mathematics skills lead them to opt for careers outside of science. 3. Professional role confidence: women and men develop different levels of confidence in their ability to become successful members of their profession. The study, published in the American Sociological Review, finds that family plans and self-assessment scores does not reduce female students’ likelihood to stay in engineering. By contrast, confidence in professional expertise predicts career persistence. The authors speculate that these results may explain why women in medicine cluster in more typically female-friendly specialties. Fortunately, programs can help address the gap in professional role confidence by exposing students to work internships so that they can build familiarity with the profession. Traditionally, one of the explanations for the relatively low percentage of women in the faculty ranks of math and science departments has been the ongoing presence of discrimination. At every level of training and career, scientists must earn acceptance from peers, whether in admission to graduate programs, job interviews, or grant reviews. Bias, even if unconscious, can creep in to disadvantage female applicants, the theory goes. A new study by two scholars in Cornell’s Department of Human Development argues that discrimination does not play a factor in the underrepresentation of women in scientific fields. In the awarding of fellowships, the review of manuscripts, and the interviewing for jobs, the authors found no evidence for bias against female candidates of comparable preparation to their male counterparts. The real source of inequality is that women overwhelmingly occupy part-time or teaching-intensive positions, limiting their access to the resources needed to produce sophisticated research. Whether by choice or by societal expectations, women often prioritize what the authors call “fertility/lifestyle” concerns in establishing their careers. These decisions make it less likely for women scientists to develop a track record of success. The good news is that women scientists of similar training and accomplishment can count on fair treatment in the academic workplace. The underrepresentation of women in science and engineering can feel insurmountable. Women earn only a quarter of PhDs in the physical sciences, mathematics, and computer science. It would appear that the cause of this disparity is deeply rooted and hard to eradicate. Professors at the University of Colorado, Boulder attempted a seemingly minor intervention with 400 students in a challenging physics class. Twice during the semester, students in the test group wrote for 15 minutes about their most important values. The control group wrote about values that did not have personal relevance for them. These exercises were unrelated to the material of the course, but they displayed an outsized influence on students’ performance. As published in Science, male students in the control group significantly outscored female students in tests of physics mastery and the course exam. But women who took part in the “values affirmation” exercise erased that gap and even exceeded the male students’ scores on some measures. The results suggest that women students underperformance has more to do with stress and psychological barriers than any innate deficiency. Their findings reinforce what psychologist Claude Steel has argued in relation to racial stereotypes. Stereotypes influence self-perception, and self-perception determines performance. A simple confidence booster can prime a student to achieve at her or his highest level. Academics tend to be open-minded people and understand how unproductive stereotypes can be. Despite this tolerance, hidden bias creeps in. Take letters of recommendation. This time of year faculty receive requests to write on behalf of students applying to graduate school, trainees applying to faculty positions, and colleagues applying for fellowships. There’s a conventional format for these letters, which are uniformly positive. Both kinds of adjectives have a place in academia, but when search committees reviewed the letters, they rated the male attributes more highly. Without intending to, letter writers may be disadvantaging female candidates. The NIH is now funding a study to see if this pattern holds true in medical schools. Inside Higher Ed’s report on this research generated over two dozen comments. The study’s authors say a candidate can show the research to potential recommenders to make them aware of hidden bias. Of course, as some readers pointed out, another solution is to educate search committees to value the communal qualities associated with women. Because when it comes to obtaining leadership roles, being known as “caring” and “nurturing” won’t help a candidate.